It is with immense pleasure that we bring to you the 4th Edition of the OpenStack Cloud Computing Cookbook by Packt Publishing! Brought to you by 4 talented authors from Rackspace: Kevin Jackson, Cody Bunch, Egle Sigler and James Denton; a host of tenacious technical reviewers: Christian Ashby, Stefano Canepa, Ricky Donato, Geoff Higginbottom, Andy McCrae, and Wojciech Sciesinski; and a Packt team keeping us in check! We have listened to your feedback and attempted to bend as many rules as we can to bring you a book that will help you understand, deploy and operate an OpenStack cloud environment. When the 1st Edition was written in 2012, I didn’t think I’d still be updating it today to make a 4th Edition! Thank you to everyone involved. To the clever people that helped bring this to fruition, I thank you. To our readers – please enjoy! Pens down. It’s a wrap! 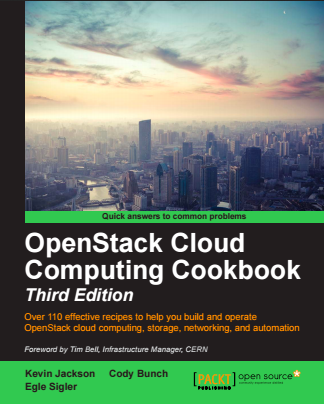 OpenStack Cloud Computing Cookbook 3rd Edition coming soon! 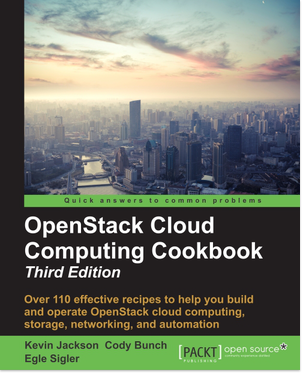 Late Friday night July 3rd 2015, or early evening to my US counterparts, we finished the edits on the OpenStack Cloud Computing Cookbook, 3rd Edition. Wow – 3 Editions. I started writing the first edition back in 2011. Back then, OpenStack Diablo was THE production ready release. 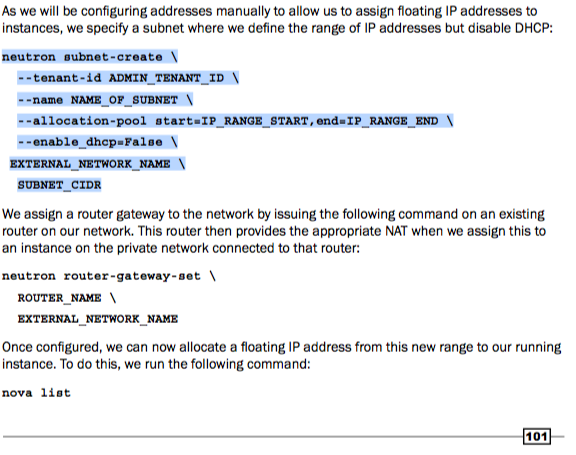 It had many promises and I was keen to learn more after dipping my toes into the OpenStack water with the Bexar release months before. Of course, I pronounced this wrong. So much for a country who frowns upon our additional characters in the English language. This book was very popular and has taken me on a journey I wasn’t expecting. As time went on, Diablo wasn’t as hot property as it sounds and after being approached by none other than Cody Bunch who convinced me to write another, the 2nd Edition was needed. This was another 10 months getting a “few updates” in the book. This was published in June 2013 and was based on Grizzly. Fast forward towards the end of 2014 and through a mental lapse, Cody yet again thought it might be a good idea to do another. Along the way of ideas, we picked up the esteemed Egle Sigler. Putting in a few more updates and with 50% more help, this would be a breeze to get the book updated for Juno. Or so we thought. About 8 months later, we made it. We have updated sections that include how to install the very latest OpenStack Kilo using Ansible. Over 110 recipes has had an upgrade, rewrite or is a brand new addition to the book. We listened and we have a book that takes you through all the essential components and much more. We take you through step by step instructions on how you could run this in your datacentres. Andy McCrae, Sriram Rajan, Melissa Palmer, Stefan Lenz, Chris Beatty, Walter Bentley and Victoria Martínez de la Cruz. And a big shout out to Tim Bell for writing an excellent foreword to the book. We are truly honoured. I’m expecting a signed copy from him in the post. So go out and by the thing. You won’t regret it. Thinking of taking the #OpenStack Certified Administrator exam? Up to 50% Off OpenStack Books! Get your learning on ahead of the OpenStack Certified Administrator exam by purchasing the above books written by Rackspace OpenStack authors! Two must have OpenStack books, up to 30% off! 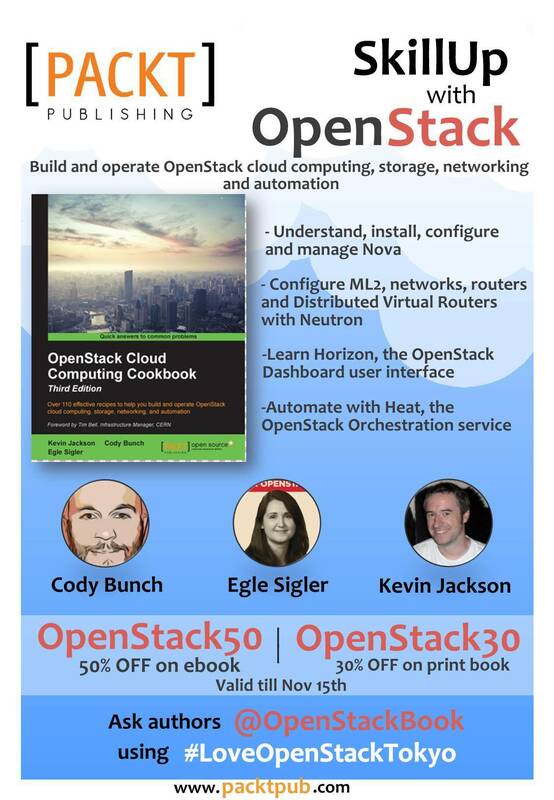 Get up to 30% off a copy of the OpenStack Cloud Computing Cookbook (3rd Edition) and Learning OpenStack Networking (Neutron) 2nd Edition using the codes below! We really do appreciate our readers taking the time and effort to write reviews of our book. We actively encourage feedback and this is presented in the book on how to do this. As we maintain a very active GitHub repository of a complete working OpenStack environment, code and examples – we positively encourage people to give us feedback so we can improve our code and writing. UPDATE: The reviewer contacted us to say how happy he was to have his concerns addressed and as a result, the review has been removed. Thank you. I have removed references to emails so this post offers a guide to future reviewers on how to give us feedback. The problem with reviews is that it tends to be a one-sided conversation though, with us only being able to respond to the damage that has already been done. We were recently alerted to a 2-star Amazon review [Edit: Now removed] that contradicted conversations that I’d had with the reviewer. We thought the best way to address this was by explaining why the review is incorrect. A rebuttal 5-star review by an author would help fix the ratings – as people do judge Amazon books by the star ratings – but would be false and equally damaging. Fortunately in this incident, I had a 2-way conversation with this reviewer. It started on Twitter then progressed to email. The first issue was to raise awareness around syntax used in the book and the use of under_scores and not hyphen-ated flags. The neutron client allows both. Arguments exist for what would be more correct, but to say it is invalid is completely wrong. Please contact any of us on Twitter, or email book @ openstackbook.com, fill in bug information on GitHub regarding the environment and scripts not working, or directly with the Publisher. You can follow us and comment on G+ and you can like or post messages on Facebook. You can even leave a comment below.